Fall was in full bloom and Halloween was just around the corner. The pooka had not been seen since that incident in the woods with Jack. But, with all things being equal, time would tell and if the trickster fairy was going to make a move that would really be the time. As the seasons change, beautiful magical events begin to unfold. The children now learn that Nana has been keeping secrets. Are her stories real folklore or real magic? 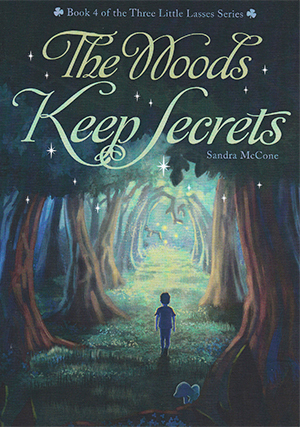 See for yourself as the secret is revealed in Sandra McCone's fifth book in the Three Little Lasses Series Folklore or Magic. Her children loved hearing the stories of her childhood experiences and when the grandchildren came along Sandra was inspired to write a poem about them, their adventures, and the country property that was their playground. Out of a desire to share these stories with other children Sandra wrote the first book, “The Secret in Nana’s Garden” and created the brand ‘The Three Little Lasses. The original poem was adapted into a song with Irish melody and instrumentation and accompanies the first book. 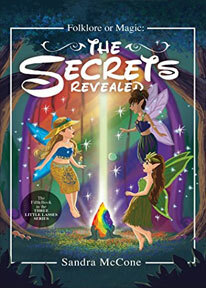 All of series including “The Magical Tea Party” , “Midsummer's Magic”, “The Woods Keep Secrets” and her newest book “Folklore or Magic – The Secret is Revealed” allows the reader to experience the warmth and magic of Nana’s country home and land. The imagination of the children and the things they discover make the reader yearn for more. The children come to realize that Nana has been keeping secrets and their curiosity to learn more leaves the reader wondering, "Does magic really exist in nature?" The series is written in an unique way. The first and second books are short reads, one chapter each, and contain colorful graphics that are intended to invite and hold the attention of young readers. The subsequent books slowly increase in volume and complexity. They are designed to enhance the reading and comprehension skills of the youthful reader while exposing them through magical stories to the traditions and celebrations of old Celtic beliefs, the parallel with our modern traditions, and the folklore and mystical world of the Fae. Sandra believes this to be a wonderful way to keep children of all ages reading. Using their own imagination and discovering for themselves the magical world around us. Sandra travels with her books giving programs as the faerie lady “Alisandra,” magically entertaining children of all ages with her stories. You can see her at many Irish Festivals, Celtic Highland Games or maybe at your local school. Sandra McCone (Alderman), author of the Three Little Lasses Series, grew up in the 1950s in the Midwest railroad town of Galesburg, Illinois. Coincidently, she lived on the same street, two blocks away from the home of writer Carl Sandburg. Sandra’s childhood was enhanced by her extraordinary imagination as well as the imagination of those around her. Her love of art was evident in many aspects of her creative nature. As an adult, she pursued a career in interior design and formed her own business. She married her high school sweetheart, Alan Alderman and had three children. Tales of Ireland inspired her to create a country home reminiscent of her heritage. It is this home that sets the stage for her series. Her children loved to hear stories of her childhood adventures, and when the grandchildren came along they were no different. At that point, she decided to write these stories and adventures, so they could be shared with other children—thus starting the adventures of the Three Little Lasses. “The Secret in Nana’s Garden” and “The Magical Tea Party” allows the reader to experience the feeling of Nana’s country home and land. The imagination of the children and things they discover will make you yearn for more.